On November 8, the James Cohan Gallery will present Pictures From the Surface of the Earth, an exhibition of photographs by Wim Wenders, the acclaimed film-maker best known for films such as Paris, Texas (1984), Wings of Desire (1987), and The Buena Vista Social Club (1999). This will be the first exhibition of his photographs in New York. Since 1983, Wenders has developed a major body of photographic works from his travels which have taken him around the world. Our exhibition will focus on his large-scale panoramic photographs taken in the American West, Cuba and Israel. For Wenders "the road" has held much allure and has been the driving force in his cinematic and photographic career. In his images of urban and rural landscapes, the essence of a place is captured and becomes the main character driving the narrative. They are stories unfolding within a single frame. Many of Wenders' photographs-especially those taken of the American West-are evocative of the paintings of Edward Hopper, an artist whom Wenders credits as perhaps his greatest influence. "With Hopper" says Wenders, "you sense everything is just around the corner. The openness to action is all there. They are about the quiet before the storm." Horizon line, scale and color are dominant features in Wenders' unmanipulated photographs which can measure up to 15 feet in length. He has stated that "the size is strictly in reverence to the places that are represented in the pictures". The physicality inherent in the photographs allows the viewer to fully immerse oneself in the body of the picture. A book of Wenders' photographs titled Pictures from the Surface of the Earth was published in 2001. A museum exhibition of the same title has been touring Europe since 2000 and has included such venues as the Hamburger Bahnhof, Berlin and the Guggenheim Museum, Bilbao. The exhibition is exhibitionsly on view at the Museum of Contemporary Art, Sydney and will travel later this year to the City Art Gallery, Wellington, New Zealand. Wim Wenders exhibitionsly lives and works in Los Angeles and Berlin. 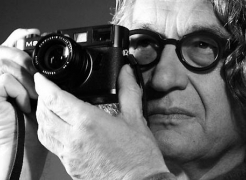 For more information on Wim Wenders, please visit www.wim-wenders.com.